Home » Can We Help the Environment with Our Modern, Electronics-dependent Lifestyle? Earlier this year, The New York Times published an article by Kendra Pierre-Louis called "Americans Are Staying Home More. That's Saving Energy." The article refers to a study about the positive effects on the environment that have resulted from more people working remotely and shopping online. Despite these positive developments, the article questions whether people are truly saving energy if they are multitasking, working a second shift at home, or using more electronics. The article, in fact, suggests this could ultimately have a negative impact on the environment. We at Beyond Efficiency believe not only in efficiency and supporting the environment but also in human-centered buildings. So when I read this article, it inspired me to explore how well its propositions fit into what we know and practice. I will specifically look at technology, use of home or business office, and transportation, because these are areas where working remotely would most likely save energy and help the environment. As someone who works part-time at Beyond Efficiency and goes into the office just a couple of days a week, often I must accomplish a number of tasks remotely. I also may order supplies and food for staff online. As a result, I frequently find myself multitasking and giving my computer a workout. Using technology makes it possible for me to keep a lot of balls in the air and accomplish a great deal quickly and efficiently. Yet technology does take energy. If energy is generated and used in a thoughtful, conscious way, it can have a lesser impact on the environment. Energy created from a dirtier energy source like fossil fuels can have an overall negative environmental impact, while cleaner energy from solar or wind power may have a negligible impact. When considering working remotely, an important part of the equation is where the energy that powers the technology for work comes from. How does your electric company create its power? What steps do you take individually to reduce environmental impact? One example: Using rechargeable batteries—even those recharged by solar—to power a computer may seem like a cleaner alternative. However, the manufacture and disposal of those batteries can take their toll on the environment. Regardless of whether you are using technology to accomplish work wherever you are, the environmental impact depends on the kind of energy used. So helping the environment by using technology to work remotely appears to be a wash at this time. Another factor to consider is the built environment. Depending on how efficiently an office building was constructed and is operated, it can be difficult to determine whether there are savings when it comes to working at home. And regardless, the benefit of office space is to bring staff together face to face to share ideas, collaborate, communicate more clearly, and hopefully advance the corporate mission. Another question is whether a building is human-centered. If not, it can impact productivity. Without appropriate air quality, lighting, temperature control and more, it could take staff longer to accomplish tasks, and this could result in longer hours with greater energy consumption. In terms of transportation, going to and from an office also takes energy whether by car or public transit. Only biking and walking to work seem negligible in terms of environmental impact. There can be some savings when you "trip link" errands on your way driving to and from work. Even if you use an electric car, if the electricity that powers it comes from a dirty source, it is difficult to know how much you will actually be helping the environment. And if items are ordered online for delivery, the deliverer will be using energy to pick them up and deliver them. Once again, it is not clear cut whether saving that ride has much of an impact. The Times article reflects on people who might have a second job from home that is online and calls for more energy than an average person. Once again it seems unless that person is using clean energy, it will have a greater impact on the environment. The hope is over time, people will become more conscious of the kind of energy they use, and more clean energy options will become more readily available. These will be necessary to tip the scales towards a clearer response to the question about energy savings when working remotely. To be more conscious, it might be helpful to think about the visibility of energy. We humans are at a disadvantage in that when we use energy, we do not visibly see our impact on the environment in the moment. For example, if car exhaust permanently colored the air blue, we would see the lasting effects of driving a car. I can’t help but wonder: If the environmental impact from energy emissions was more visible, would we be motivated to change our habits or find alternatives more immediately? At Beyond Efficiency, we strive to help buildings be more efficient. With more efficient buildings, hopefully choosing where to work will be more easy and obvious—that is, the location that saves the most energy and offers the greatest benefit to the environment. 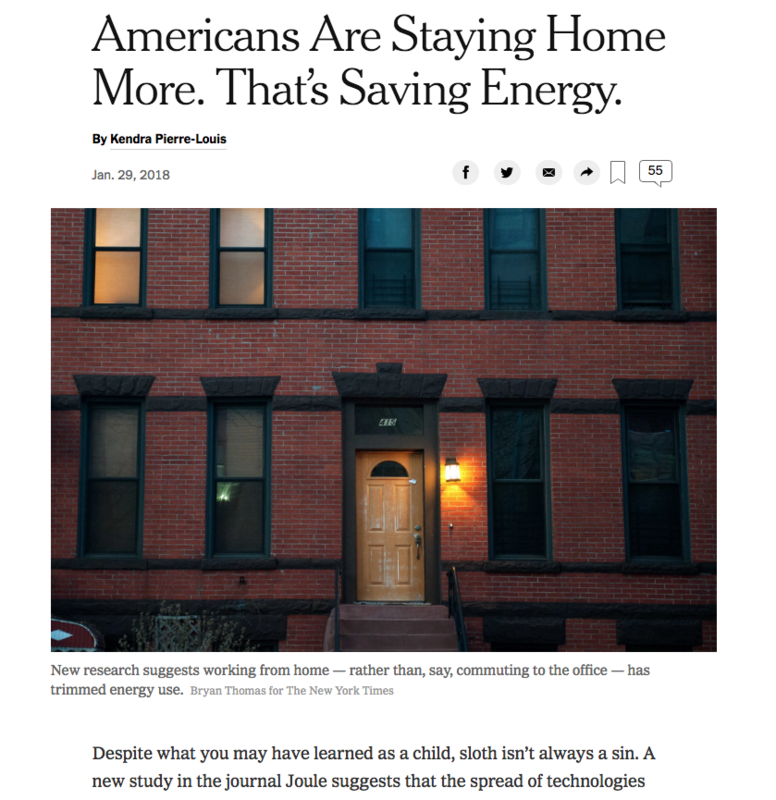 Upon reflection, The Times article notes more people are staying home because of technology and the study looked at whether that was ultimately helping the environment. Seeing as the answer is only clear based on the amount and kind of energy being used, maybe a better question to explore is not so much whether working from home saves energy, but how can we ensure all environments save energy no matter where you work or live?